I’m not sure whether I’ve mentioned it or not, but my parents bought an RV this past spring. They are in the process of selling everything they have and hitting the road full-time. Their goal is to be out of Iowa before the winter hits, but at the rate they are going, I’m not sure it will happen. I see another Iowa winter in their future. Anyway, we’ve been learning a lot about RVing from them as they were here for a visit in August and we talk to them almost daily. It’s a fascinating lifestyle and full of interesting bits of learning. I find it fun to hear about the whole adventure. Many of you probably also know our friends Steve and Courtney. Steve runs the site Think Save Retire and is also my partner in crime at Rockstar Finance (he runs the tech stuff). Courtney is the main driver behind A Streamin’ Life, their YouTube channel documenting their lives traveling across the country in an Airstream. Once I found they were doing a course, I KNEW I had to have them write a post on RVing for ESI Money. After all, we talk so much about retiring early, isn’t it also good to talk about what we’ll do with that extra time? I think so, and RVing is a great option! So why not learn a bit more about it? In addition to the post, I asked Steve and Courtney if they could give ESI Money readers an extra special deal on the course. They agreed and here’s the offer: The course sells for $297 and they are offering an intro price of $197. Then for us they are giving an EXTRA 40% discount to get the cost down to $118! It all automatically is calculated for you as long as you use this link. BTW, in addition to the course itself students get access to a private Facebook community where they can ask questions about traveling and planning road trips. Since Steve and Courtney will both be in that group, students essentially get “free” access to ask them anything. Not many courses offer that. The course also includes downloadable worksheets to help RVers keep track of their plans. Students also get lifetime access to the course, including free and unlimited access to all updates and additions. And, of course, there’s a 30-day money back, no-questions-asked guarantee. If you’re interested, use this link to receive the benefits detailed above. Some people call us homeless. We like to think of ourselves as mobile. Back in April of 2016, my husband (the blogger!) and I sold everything we owned (including our two homes) and moved into our 200 sqft Airstream travel trailer. Soon after the move, we hit the road and started traveling full-time. There was only one problem: I had never camped before! Let’s just say that the whole thing was a huge learning experience, but we love our life and wouldn’t change a thing. We love the flexibility that full-time RVing gives us. We love the people we meet, things we do, trails we hike and restaurants we visit. To all of you who have thought about hitting the road in an RV and to those who have never even dreamed of it (and, yes, even to those who think this lifestyle is crazy), here are 10 reasons why you might want to consider RVing full-time from a couple who has done it. Since you are reading this blog, I know FI (Financial Independence) has to be on your radar. How do you gain your financial freedom? By spending less and saving more. And there are so many different ways to get there. 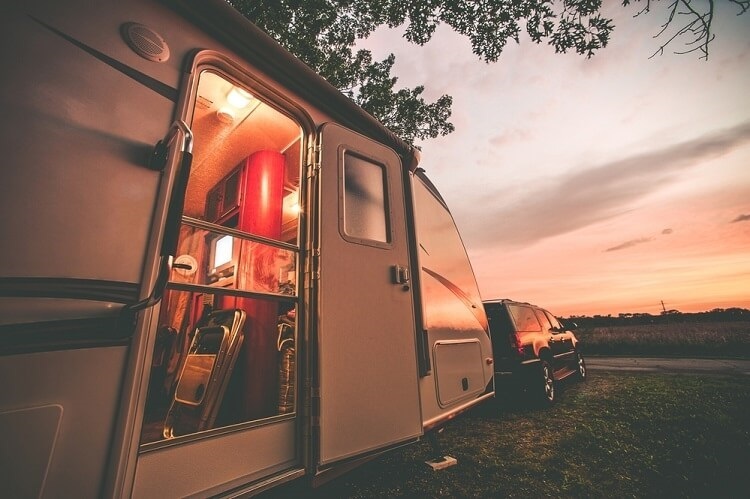 Living in an RV full-time can drastically shorten your FI journey. By moving into our Airstream, my husband Steve went from retiring at 40 to retiring at 35! How? First, we have a lot less space. 200 sq ft does not store all that much. That means we really need to examine everything we buy not only in terms of the budget but also in terms of where it’s going to go. Second, we ditched most of our monthly expenses. We no longer pay for water, electric, trash, sewer, gas, a mortgage, property taxes, hoa fees…you get the idea. But what about camping fees you may ask? Don’t those add up? Yes and No. We can choose where we camp and how much we spend. Every time. While we could spend as much as our previous mortgage on a nice camp spot for the month, we usually decide to camp for free in the wilderness and not spend a dime. That’s a lot more flexibility! Plus, everything we spend can be charged to credit cards to earn points for free travel. So that’s a win! When your expenses drop, amassing FI-enabling fortunes becomes much easier. Everyone gets bored right? Not so much when full-time RVing. Your backyard is constantly changing and there are always new things to do and see! If you get tired of what is outside your office window you can pack up and move somewhere else. Not only is your physical location always changing, but so are the people around you. You can go from a campground full of families enjoying their vacations to a remote off-grid location surrounded by adventure-seeking mountain bikers. If you ever find yourself scrolling through TV channels or zoning out in front of YouTube because you have nothing to do…RVing full-time can definitely solve that problem for you. We don’t own a TV and we don’t miss it. Seriously! Yes, we will occasionally stream things on our laptops and Steve still loves his football in the fall, but we spend our days and nights a lot differently than we did in the house. We are hiking two to three times a week and seeing absolutely epic natural wonders. We’re exploring new towns and sampling brews at the local breweries. We are buying local produce at farmers markets and cooking up fancy dinners. We are sitting in our camp rockers having happy hour around a campfire while listening to a gushing river. Though this lifestyle isn’t always a “vacation”, I can honestly say we are never, ever bored. Reason Three: No More Yardwork! Do you hate to mow the lawn or wish you never had to pick weeds again? How many hours a week do you spend doing yard work or how much money do you spend to have someone else do it? Same goes for cleaning the house. How long does that take? Have you ever felt like your entire weekend is spent doing chores and NOT relaxing? When you full-time RV, you don’t have to worry about the yard anymore. You don’t have one! If you are in a campground they maintain it for you. If you’re out in nature, there is nothing to maintain. The time and money we spend on yard work is literally 0 and Steve is loving every minute of it. I can’t say quite the same thing about cleaning. We do live in a 200 sq ft trailer but it’s our home and I like to keep it neat and clean even when we are camping in the middle of nowhere. However, cleaning the Airstream on average takes about 20 minutes and that’s for a pretty deep clean! Daily tidying is about 2 minutes. That’s it! We have a lot more time to spend having fun rather than doing those chores that had previously devoured our weekends. Steve and I met in Tucson, Arizona where we both moved for work. We both really liked living in the desert but we had nothing tying us to all those cactuses besides our jobs. But, if you asked us where we would like to live, if we could choose anywhere in the country…We would have no idea what to answer. We just hadn’t seen enough of it! Like many, we have always chosen where to live based on outside influences such as family obligations or work assignments. We had no idea where we would settle down if we could make the choice. As full-time RVers we get to explore communities all over the United States. While we are enjoying our travels and seeing the sights, we are also figuring out what we like and dislike in places to live. We like being able to walk or bike places so we aren’t forced to drive everywhere all the time (save that gas money, baby!). But we also like being able to go hiking and get into the mountains or swim in a lake on a hot day – so, being in the middle of a big city isn’t right for us. Cost of living matters and is a factor, as is average temperatures and precipitation (all that time in the desert we would miss our sunny days!). We have met countless full-time RVers who are on the lookout for their forever home. We’ll be RVing until it’s no longer fun and when we quit we will have a short list of the places we know we will LOVE to live. What better way is there to find them than by living in them? Steve’s folks full-time RVed for nearly 13 years, and I’ll never forget what happened when his grandparents passed away in northern Arkansas. Steve spoke to his folks nearly every week and, as full-time RVers, they camped right outside of his grandparents place taking care of things for the family. Cleaning the house. Selling old junk. Even selling off the house and property. Those are all things that needed to be done, and their lifestyle enabled them to spend a couple of months in the comfort of their own home – right where they needed to be. One of the major questions that we were asked before hitting the road was about friends and family. How were we going to make friends and spend time with people if we’re always on the move? It’s something we struggled with, too, because we didn’t know exactly how to answer that question. We quickly learned that the flexibility we have with our lifestyle makes it easy to see friends and family – and, frankly, to make new friends too (social media helps with that, big time!). We can drive wherever we need to drive. We visit whomever we want to visit. We’ve spent weeks in driveways of friends over the past several months. Every night, we’d have happy hours and cook dinner together. During the days, we’d adventure together. Hike together. Bike together. Everything…together. In reality, full-time RVing has made a huge difference in the number of friends that we have and in our ability to see them. It’s one of the things that surprised us the most about full-time travel. Steve and I hate extreme weather on both ends of the spectrum, and one of the greatest benefits of full-time travel is the ability to “follow the weather”. This means that in the summer, we spend a lot more time in the Pacific Northwest and, in the winter, we’re bumming around in the warm and sunny air of Arizona. We have family in AZ, so that makes the decision very easy. Though there’s a good chance we’d spend winter down there anyway. In our first year of full-time travel, we were caught in some cold weather in Montana. As the snow started to fall, we began looking at our options. Especially in an RV that’s as weather-tight as a screen door, we need mild temps. Once mother nature broke out the snow, we broke out Google Maps and started looking south. In a day, we were hundreds of miles south enjoying a happy hour in the 60s rather than the 30s. When the average square footage of a home is over 2,000 square feet, we begin to get used to a lot of space. Huge dining rooms. Master bedrooms with its very own sitting area. En suite bathrooms that span the same square footage that entire homes did a century ago. We are used to seeing huge spaces, and naturally, we want to live in them! The problem? Most of us don’t use all that space. We tend to congregate in the kitchen and living room. We only use big dining rooms a few times a year for holidays and parties. There’s a ton of space in a lot of homes that just doesn’t get used. However, we still pay for all that square footage. We paid for it when we bought the house. We pay to heat it and cool it. We also pay in the time it takes to keep those areas clean and well-maintained. In other words, there is a heck of a lot of time and money spent on space that so many of us don’t use. We moved from a 1,700 square foot home into a 200 square foot Airstream. This lifestyle definitely took some getting used to, but Steve and I found that it just takes a change of routine, that’s it. We don’t “feel” like we’re living all that small anymore. This space has become a part of who we are, and it’s nothing more than our new routine. Our bills are a fraction of what they were before. We only buy and keep the things that matter the most to us. We use 100% of the space we have, and it’s a remarkably satisfying feeling. Honestly, Steve and I never considered ourselves to be naturally curious people. We were set in our ways and generally had our lives figured out. But, we also knew there was so much more out there to see, and the more we’ve seen, the more curious we get. Every little town has its own special quirks. Unique diners. Weird looking statues and beautiful parks. I had no idea even half of this stuff existed in this country! We love farmers markets, and so many areas of our country offer an opportunity to buy produce and other knick-knacks straight from the source. Straight from farmers and artists. The curiosity continues to build. And, it’s one of the most special parts of full-time RVing – satisfying our curiosity for virtually anything, including some elements of life we never realized existed. For example, I had no idea how complex and intricate our nation’s grid of roadways was until we started driving them. Now, all that planning, testing and development is downright amazing to me. The more we see, the more interesting life gets. There are so many epically beautiful places to see in our world. Towering cliffs, majestic mountains, sweeping vistas, thundering waterfalls, glorious fall colors, crashing waves, tranquil beaches, swaying aspen groves and crumbling red rocks. Our natural world is spectacular and one of the absolute best ways to see it and experience it is in an RV. RVs allow us to be directly in it. Many of our National Parks are hard to get to and even harder to stay near…when you’re not in an RV. When you’re in an RV, you can stay right in the park and have everything at your doorstep. Not only do you get to see it, but you get to experience it! Living in a RV, you have a much greater (and more constant!) connection to nature. You need to know when the sun rises and sets, what the temperatures are going to be, what the weather is like. You get to see the moon every night, stars twinkling overhead and hear the natural sounds around you while you fall asleep with your windows open. You aren’t just visiting nature. You are LIVING in some of the most spectacular places in the world. Steve and I just got back from a family trip where we had to fly to our destination. Not our favorite mode of transportation. How could it be our favorite when most of the time we get to bring our own home with us wherever we go? Whether we are in a friend’s driveway or out in the forest, we have everything we own with us. We never have to worry about being caught without a scarf or a jacket or not packing something important. We can even pop into our home on road trips and whip up a home cooked meal in a gas station parking lot – if we need to. Traveling via airplane and hotel now seems like such a pain. Fitting everything we might need into a suitcase always ends up with us packing too much or leaving something we could have used. The lines of people and the stress of travel days seem endless. If we get caught in traffic in the Airstream, we can always pull over early and spend the night somewhere else. After all, we still get to sleep in our own bed. It has really spoiled us when it comes to travel! Hopefully, these 10 reasons why you might want to consider RVing full-time got you thinking about travel or living a mobile lifestyle. While this way of life certainly isn’t for everyone, it can be for anyone…even you! Fascinating! I have been intrigued by the RV/tiny house on wheels movement, and these are wonderful reasons why it’s a terrific lifestyle- if your circumstances allow it! Our jobs aren’t mobile and we aren’t anywhere near FI, so for now it has to be a thought experiment for us- but there’s definitely a lot to think about! Thanks so much for those kind words, Patsy! Thinking that renting an RV For a few weeks or months might be a good option as well – to test out the lifestyle before jumping in. I agree, renting is also a good option. Regarding health insurance, we use Liberty Healthshare. For full-time travelers, that’s our only affordable option. The marketplace doesn’t come close to offering something that works for us. And no, we don’t have a primary care physician, but we are also in good health and almost never go to the doctor. We are considered cash-paying patience which, in some cases, encourages hospitals to cut their prices even cheaper than a health insurance company might negotiate (because they actually want their money!). No home base at the moment, actually. The Airstream is it. We domicile in Arizona, though, using my in-law’s home address – so, all taxes get paid as Arizona residents. Great article, you make RVing sound really inviting. I’m curious about one detail. Once you get to an RV park and settle in for maybe a week, how do you get around to do shopping and site seeing? Is it just bikes? I’m thinking that going food shopping in bad weather on a bike wouldn’t be so fun. We do have bikes, but the truck that we use to pull the Airstream works just fine as our primary vehicle. It’s certainly bigger than a regular vehicle, but it’s still very doable even in smaller cities. Very interesting article and thanks for the great tips and first hand POV. My friends Steve and Julia are also full time RVers. Great post, I can see the appeal for some people even if it doesn’t sound like something my wife and I would enjoy. When we travel part of the fun is not having to cook or clean plus our hobbies and my side gigs are not fully mobile. But if you do not have those limitations I can see where it would be fun. We have friends that live in RV’s and they have enjoyed it for years. It’s true that this lifestyle won’t be for everyone, but it does work for more and more people…especially as our society becomes more mobile friendly. Appreciate the comment! That’s my dream to live in an RV full time, but my wife is hesitant. She loves to Travel but also loves the security her job gives her. We rented an RV once for vacation and let’s say it didn’t go so well. I still have my hopes that it will become a reality once we no longer need her job! It’s definitely a change of pace! For my wife and I, it was just a different (new) process and routine. Once we got used to things, everything else just fell into place. Appreciate the comment! It’s one of our biggest dreams. In the future we’ll surely get an RV and see where life takes us. We’ll probably need to stick to our new city for a while, so daughter can get into school, but we’ll surely RV in the future.